It was only 36 years old, but it felt like a step back in time to a slower, more connected world (actually physically connected, not just Internet-connected). Country Village in Bothell, an assemblage of little shops and restaurants stitched together by meandering trails, will soon be bulldozed to make way for yet another drab collection of ticky tacky boxes. This quirky little place was constructed by one family starting in 1981. I first visited in the early 1990s when I worked in Bothell, and my co-workers and I dropped in for lunch and Christmas shopping. In the following years I'd visit with my daughter, who loved riding the little train and watching the chickens and ducks roaming the grounds. My daughter grew up, as daughters tend to do. By and by, I sat by the pond with my mother during her final summer, watching children play on the big pirate ship. But the wrecking ball will soon take a swing at it all, and only memories will remain. I visited Country Village during its last weekend to snap a few pictures, stroll the grounds, and reminisce. It was filled with other visitors who'd come to pay their respects, many of whom had played there as children themselves. A shopkeeper told me that the day before, he met people who'd flown in from out of state to say good-bye. Many tears were shed. On this beautiful sunny Saturday, children dashed from playground to playground. A gaggle of teenage girls crowded into the crow's nest of the pirate ship for a photo, no doubt recreating a scene from their childhood. Groups waited patiently to take pictures in front of the cart-horse statue. And, of course, the giant chicken. I asked one shopkeeper if there was any chance that the developer was going to keep any of the beautiful trees or quaint features or the 1901 farmhouse. The shopkeeper sighed and just extended his arm to indicate the condos already built in an area sold several years ago that used to be a pasture. I sighed, too, when I saw the gray monoliths. Yes, I know people need places to live, but surely it's possible to build housing without destroying everything that's quirky, fun, beloved, or interesting about a place and replacing it with cookie-cutter housing and the same chain stores over and over again. Driving around the area nowadays, it's sometimes hard to know what community I'm in because they all look alike--a series of mall parking lots connected by roadways, all boasting the same stores. Country Village provided a nice "third place," where people can gather other than in homes or workplaces: a town square in New England, a pub in Ireland, a coffee shop where everybody isn't wearing earplugs and riveted to a screen. I recall a lovely coffee shop in Seattle that closed up due to a rent increase in a neighborhood I once lived in. When I told the barista that I was sorry to see her shop go, the woman in line behind me huffed and puffed. She pontificated about how stupid it was to be sorry about things leaving because "progress must go on"! Just how the disappearance of a nice coffee shop that had only been in place for three years (only to be replaced by a useful but dull office that could've been located anywhere) was equivalent to "progress" was beyond me. I once heard someone blandly say this phrase back on Long Island, where I grew up, to talk about an ugly building that was constructed smack-dab in the center of a pretty park view. "Congress must go on," she said flatly (and not ironically), even though she'd just been shaking her head in dismay about the structure. Which just goes to show how stifling pat sayings can be--so shallow they're not even repeated correctly. Sure, Country Village had its share of twee shops, and its demise isn't on a par with the societal problems dominating our headlines today. But it was a nice little sparrow, and now it has fallen, and I shall miss it. Little boxes all the same." A tree I wish they'd save. Maybe there's hope as it is by a pond. It was fun to take a child on a walk around the place to look for details like this. This is next to another sign that says nothing happened here in 1897. This was a fun store, like an old country shop that had everything you needed and then some. Seriously the best chocolate chip cookies I've ever eaten. The shop, Doll House Baked Goods, will still be open throughout April (check their website for more info as well as online orders: http://www.dollhousebakedgoods.com/ but they don't have a new storefront yet. Sadly, up here in Woodinville people would love a good bakery and coffee shop, but the rents are too high for sweet places like this one or the lovely tea shop that is also shutting down due to Country Village's closure. Speaking of tea shops...I had hoped to enjoy a final cup of tea at the tea shop, naively thinking it'd still be in operation despite the imminent closure. It wasn't. Instead, they were selling off their wares. 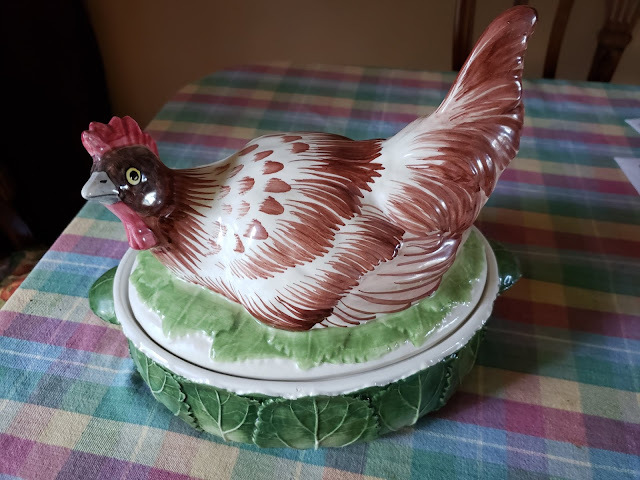 So I rescued this chicken tureen. Because our home was seriously lacking a chicken tureen. You're welcome. Wish we could.